Sunday May 18th 1884 I was over to see Callie and John in the morning and they with Henry and Ella came to Auntys for dinner. In the afternoon Lee and Arch came down after us and we got home before supper. We found John and Hatt here with the children they stayed till after supper. 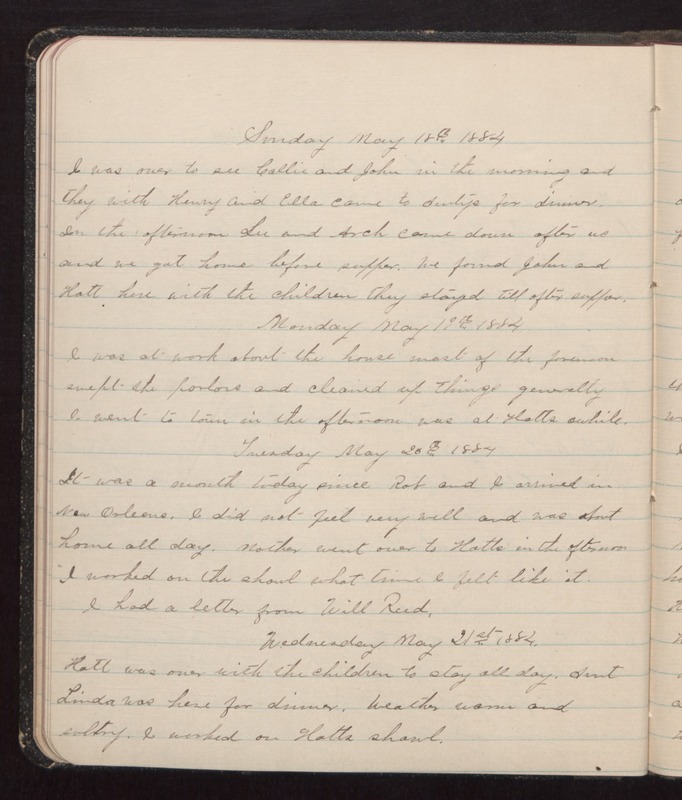 Monday May 19th 1884 I was at work about the house most of the forenoon swept the parlors and cleaned up things generally I went to town in the afternoon was at Hatts awhile. Tuesday May 20th 1884 It was a month today since Rob and I arrived in New Orleans. I did not feel very well and was about hoome all day. Mother went over to Hatts in the afternoon. I worked on the shawl what time I felt lke it. I had a letter from Will Reed. Wednesday May 21st 1884. Hatt was over with the children to stay all day. Aunt Linda was here for dinner. Weather warm and sulty. I worked on Hatts shawl.